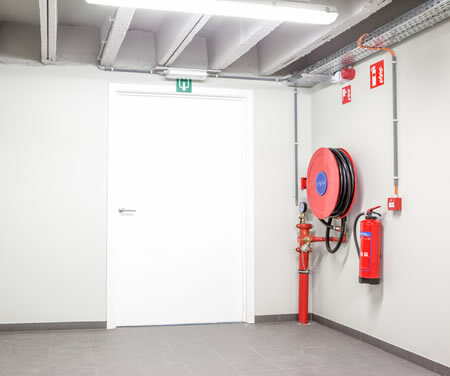 Essential Fire Safety Services are safety installations in a building that assist in reducing risk to life and property in the event of an emergency (such as fire), and are mandated in all large buildings. They include equipment and protective devices such as fire hose reels and fire doors. One (1) point of contact for all Essential Fire Safety Services inspection and maintenance needs. Identification of all Essential Safety Measures on Site. Assistance to produce Annual Essential Safety Measures Report. Management and supervision of our specialist sub-contractors and fully qualified and registered trades people, i.e. Technicians, Electricians and Plumbers. Full 24-hour emergency service backup for any emergency breakdowns. A 2-hour alarm response service time throughout the Melbourne metropolitan area. On-site training to clients in the functions of fire service equipment and practical demonstrations in the use of fire hoses and extinguishers. Emergency Evacuation Training and Evacuation Plans if required.